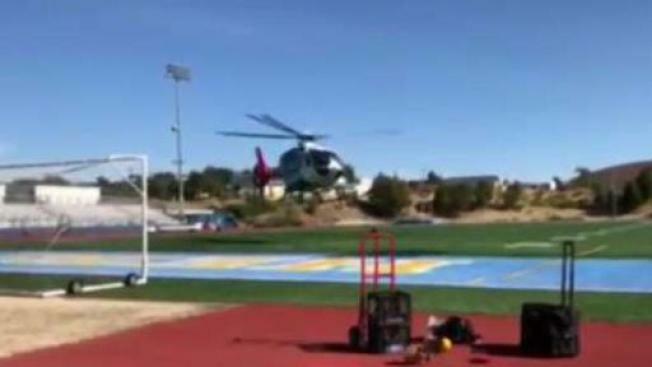 A 15-year-old Heritage High School student in Brentwood was airlifted to a hospital after he was struck in the back of the head by a 12-pound shot put Thursday. He was flown to John Muir Medical Center's trauma center in Walnut Creek where he got three staples in the back of his head before being released the same day. A 15-year-old Heritage High School student in Brentwood was airlifted to a hospital after he was struck in the back of the head by a 12-pound shot put Thursday. The incident occurred on the high school's track and it is unclear whether the incident was intentional or accidental, officials said. The teen was flown to John Muir Medical Center's trauma center in Walnut Creek where he got three staples in the back of his head before being released the same day.